Let us just get one thing out of the way: the BMW G 310 R is a very expensive motorcycle. Heck, at Rs 2.99 lakh (ex-showroom Delhi), we’d even call it overpriced. That said, on our brief first ride in Gurgaon, it had left us fairly impressed. So now that we’ve spent over a week with the bike, putting it through its paces and more, has it managed to do enough to justify its high sticker price? In order to decide that, we need to address some very important questions. Is it fun to ride? The simple answer to this is - yes! And a lot of that fun quotient comes from its 313cc, single-cylinder liquid-cooled engine that it shares with the Apache RR 310. But there are some key differences between the TVS and this BMW. For one, while the Apache uses an ECU from Bosch, BMW has gone with Magneti Marelli. And both ECUs are in different states of tune as well. They both do make the same 34PS of power but that power peak comes in 200rpm earlier on the G 310 R (9500rpm vs 9700rpm). And there’s a slight difference in torque too - 28Nm on the BMW, 27.3 on the TVS. Then, while both bikes use the exact same gearbox, they run different sized sprockets, so there’s a difference in the final drive ratio. Put all this together, and you have a very different experience when you open the throttle. The BMW packs plenty of mid-range grunt, so the bike is ever-willing to move at the slightest provocation. It’s fast to rev, and when you give it a fistful of gas, it builds up speed quite rapidly as well. And even though there’s no ride-by-wire on offer here, there’s very sharp response to be had here from the throttle. But what are the performance figures like? Well, 34PS and 28Nm aren’t the best numbers in its class. Thankfully, with a kerb weight of 158kg, this BMW is quite light, though not the lightest in its class. So we were not expecting mind-blowing numbers, and sure enough, with a zero to 100kmph time of 7.47 seconds, the G 310 R trails behind the KTM 390 Duke by 1.5 seconds. Not surprising considering the KTM is 3kg lighter and puts out almost 10 PS more. But even when considered to its distant cousin, the TVS Apache RR 310, this baby Beemer proved to be a little bit slower, reaching the 100kmph mark almost half a second later. That said, while it’s slower than its immediate competition, seven-and-a-half seconds to get to 100 can hardly be considered slow. While its outright acceleration might not be super impressive, the in-gear acceleration certainly is. In fact, here it manages to outdo most other bikes in its class. In third gear, it gets from 30kmph to 70kmph in just 3.53 seconds… that’s on par with the 390 Duke, and fractionally quicker than the Apache RR 310. And it is able to hustle from 40kmph to 80kmph in just 4.51 seconds, which is actually seven-hundredths of a second quicker than the KTM. What happens if you show it some twisties? The G 310 R’s wheelbase of 1374mm doesn’t exactly qualify as short by any means. But there is a certain immediacy in the way the bike turns into corners, that can feel a bit unnerving if you aren’t prepared for it. 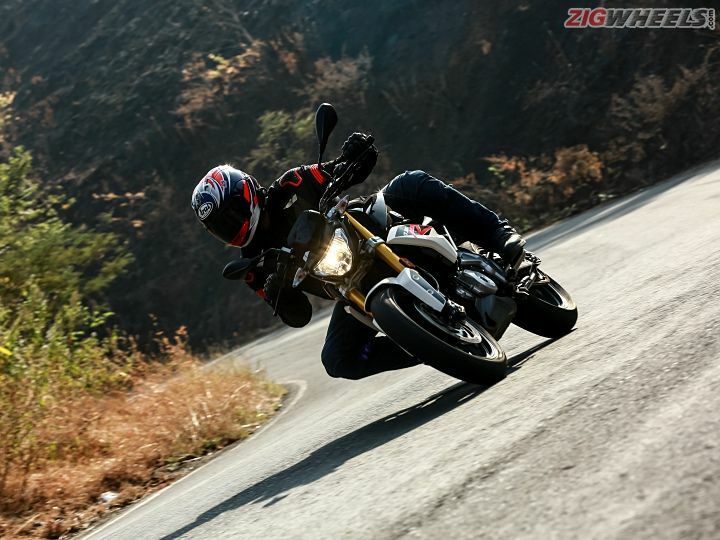 In some ways, this rapid reaction to steering inputs reminds you of the TVS Apache RTR 200, but the wider handlebars on the BMW give you more leverage, reducing the overall steering effort and allowing for more precise inputs as well. But once leaned over, there’s plenty of stability to be found here as well. That’s due to the mass and packaging optimisations made possible by the reverse inclined cylinder layout, which has allowed for a long swingarm to keep things planted mid-corner. Thanks to its high-set footpegs, there is plenty of cornering clearance on either side, which means you can carry plenty of lean angles through the turns without the fear of scraping the pegs. The kind of confidence the G 310 R inspires at these high lean angles is surprising, considering it’s running on Michelin Pilot Sport tyres (110/70 R17 at the front and 150/60 R17 at the rear). These tyres have been known to be strictly average when it comes to grip levels. But somehow these just work well on this BMW. While the brake setup is similar to the Apache RR 310 - a 300mm front disc and a 240mm rear disc - unlike the TVS, this BMW doesn’t use petal rotors. But braking performance is actually better, with the G 310 R coming to a halt from 60kmph in 18.78 metres, while taking 32.34 metres from 80kmph. These numbers might be just slightly behind the KTM 390 Duke, but are better than almost all others in the segment. Braking feel at the front lever, however, isn’t that great. Though amongst the 310 siblings (RR 310, G 310 R and G 310 GS), this R has the best feeling brakes. How does it feel on real-world roads? Out on a race track, we’re pretty sure the 390 Duke will leave it for dead, but on real-world twisties, we’re sure that the BMW can hold its own. That’s because on real-world roads with bumpy and uneven surfaces, the BMW’s suspension really shines. The ride quality on offer here is just phenomenal, whether you’re going over bad roads, potholes, speedbreakers or even mid-corner bumps. The tuning of the 41mm upside-down forks at the front and the preload-adjustable monoshock at the back feels properly sophisticated, and almost makes the new KTM 390 Duke’s suspension feel a bit crude. And the fact that it delivers such a great ride quality without compromising handling is just mind-blowing. Honestly, during our ride, we preferred the rear preload set to the softest setting. Bumping up the preload did make the rear feel even more planted in the corners. But we’d happily trade the extra stability for that comfortable ride. With a pillion rider aboard though, you’ll need to bump up rear preload as the soft rear will bottom out over sharp bumps. But it’s easy to do so using the tools provided. And speaking of pillions, the rear seat experience on the G 310 R isn’t all that great. The seat itself, though decently padded, doesn’t have too much space. The grab handle isn’t too easy to hold and overall, we’d only recommend it to slimmer pillions, that too for short distances. How comfortable is it really? The pillion experience might not be great, but it’s not like the rider is much better off. The 785mm seat height is amongst the lowest in class and the padding is generally quite comfortable. But the seat scoop is so aggressive that riders tend to get locked into position. While this is a bigger concern for fatter riders, even the slimmer ones from our team felt like they simply couldn’t move in the saddle. And then there are the high-set footpegs - great for cornering, but they put the rider in a very knees-up position, leading to a cramped lowed body posture. That’s really a shame considering just how good the upper body position is - wide handlebars, requiring a slight lean towards them, yet supremely comfortable. So does it do well at long-distance riding? Nope! Firstly, the cramped lower body posture means you’re not gonna be comfortable over long distances in the saddle. But more than that, the bigger problem is the vibrations. Unlike the RR310, this G 310 R’s handlebars are rubber mounted, and are decently isolated for the most part. But over a long journey, you do get a tingling sensation in your palms. Then at 100kmph in 6th gear (cruising speed for most), with the bike doing 6000rpm, the tank buzzes like crazy. Combined with the cramped riding position that sees your thighs tight around the tank, this buzz can really irritate your privates. What about the city then? Actually, here it fares much better. With its short wheelbase it darts through traffic with the utmost of ease. Even in stop-and-go traffic, the engine doesn’t show any signs of cooking your legs. And to top things off, the motor is very tractable in the urban environment, able to carry fairly low speeds in higher gears. That said, there’s a distinct lack of bottom end torque. So when you’re are at really slow speeds in bumper-to-bumper traffic, you really need to give lots of throttle and slip the clutch in order to prevent the bike from stalling. A slipper clutch would’ve really helped here by making the clutch action lighter. This isn’t usually a huge problem but what is a major concern is that at night, the headlight’s reach at low beam is barely 10 feet in front of the bike, forcing you to ride in high beam all the time. The one area where the G 310 R excels at is the fuel efficiency. Thanks to the motor running unstressed at city speeds, its manages fairly high efficiency in the urban environment, which at 37kmpl is better than anything else in its class. But the motor starts to get a bit overwhelmed at higher speeds, and that causes a drop in highway mileage to 31.86kmpl. Did it win us over? To be honest, we didn’t expect to enjoy the G 310 R so much. But it’s a bike that’s absolutely a hoot to ride thanks to its great handling dynamics, decently punchy motor and incredible ride quality. It’s a very handsome machine to boot and put together really well, better than anything else in its class. Even its switchgear, for example, feels like it came straight from bigger Bimmers. It’s not without its share of problems though. It lags behind its competition when it comes to features, and the vibes really hold it back from being ridden at speeds that the engine can easily do. But the biggest problem is that these issues would’ve been thought of as niggles, if it wasn’t for the price - a whopping Rs 2.99 lakh (ex-showroom Delhi). So, after a week of riding it day-in, day-out, we loved it even more than we did the first time. But unfortunately, it still didn’t do enough to change our mind about its value proposition, which we still think is rather low. And on that count, the G 310 R remains a very nice bike whose price is just too difficult to fully justify.